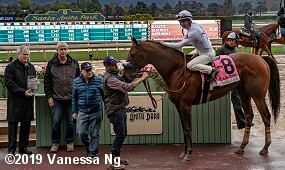 The feature race on Saturday at Santa Anita was the $200,000 San Pasqual Stakes (G2), a 1 1/8 mile main track contest for older horses prepping for the Santa Anita Handicap (G1) run on March 9. Just 4,839 fans braved the rainy weather which downgraded the main track to sloppy (sealed), with temperatures in the low 50's. After 2 scratches, just 5 horses went to post with Breeders' Cup Classic (G1) 12th place finisher McKinzie sent off as the 1-2 favorite off his win in the Malibu (G1) on opening day. 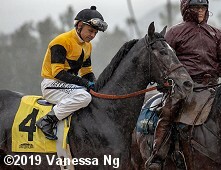 In to challenge him included 5-2 second choice Battle of Midway, 2nd in the San Antonio (G2) also on opening day, and 6-1 third choice Pavel, last year's Stephen Foster (G1) winner and Pacific Classic (G1) runner-up but last of 15 in the Champions Cup (G1) at Chukyo, Japan last out. 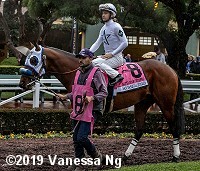 Jockey Joel Rosario sent 9-1 Giant Expectations to the lead first time by and he set fractions of 22.86, 46.09, and 1:09.33 while pressed by McKinzie and stalked by 36-1 longest shot Dalmore. Entering the stretch Dalmore and Giant Expections both tired as Battle of Midway and jockey Flavien Prat moved up 4 wide to lead through 1 mile in 1:33.90, chased by McKinzie with Mike Smith aboard to set up a duel to the line. McKinzie poked his head in front at the 1/16 pole but Battle of Midway fought back late to win by 1/2 a length in 1:46.95. It was a long 4 1/4 lengths back to Giant Expectations third. Left: Battle of Midway in the winner's circle. 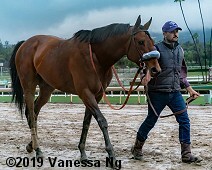 Winning trainer Jerry Hollendorfer said, "Very nice and good ride by Prat, I thought we had our horse ready and Bob's (Baffert's) horse (McKinzie) was very game too, so it was a good race. 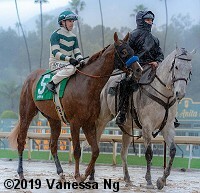 We were kind of undecided what the speed was going to be I thought Bob would send his horse harder, but he didn't do that so that kept us wide into the first turn, which was a good strategy for them." Right: Battle of Midway heads back to the barn. 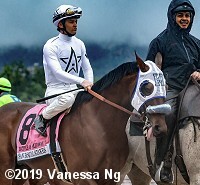 Winning jockey Flavien Prat said, "I thought to the other race (San Antonio Stakes) when we were out on the lead and we had been praised the whole way, it felt like he (Battle of Midway) was really comfortable doing that, so with the outside road today, I thought it might be better to stay outside." 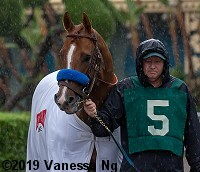 Left: Battle of Midway in the paddock before the race. Prat added, "I think the key was being outside. The draw was very important. 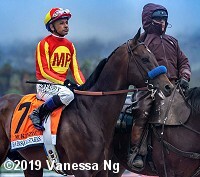 I don't think either horse liked to get pressure inside and I was able to stay just outside McKinzie the whole way. My horse likes to play around a little when he makes the lead, but he still finished good." Right: Battle of Midway in the post parade. 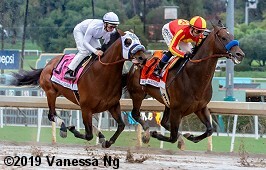 Hollendorfer added, "I thought we could get him (McKinzie) and I thought Prat rode a great race. The other horse fought back, but we got lucky in the last couple jumps. We'll enjoy this and see what's up (next)." Second place finisher and beaten favorite McKinzie in the post parade and heading back to the barn after the race. 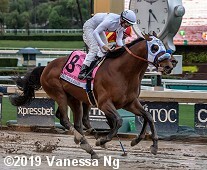 Jockey Mike Smith said, "I broke in front of him (Battle of Midway), but if I had to do it over again, I would've taken my horse back." 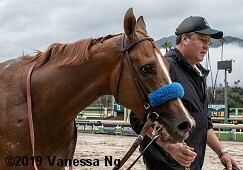 Left: Third place finisher Giant Expectations in the post paddock before the race. 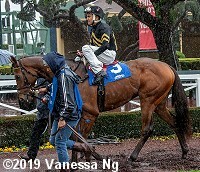 The Peter Eurton trainee improved his record to 4 wins, 3 seconds, and 3 thirds in 18 starts, earning $1,199,100 for owners Exline-Border Racing, Gatto Racing, and Garrett Zubok. 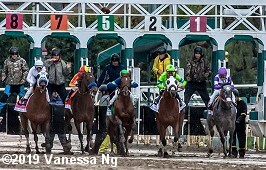 Right: The horses break from the gate for the San Pasqual Stakes. 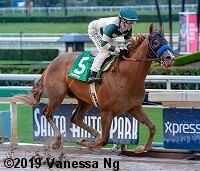 An hour and a half before the San Pasqual, a field of 5 three-year-olds (after 1 scratch) went to post for the $150,000 Robert B. Lewis Stakes (G3), a 1 1/16 mile points-scoring race in the Road to the Kentucky Derby series, the points system used to determine Derby starting spots. 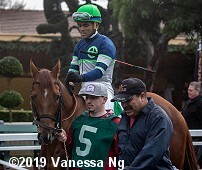 Bob Hope (G3) winner Mucho Gusto was sent off as the 3-5 favorite off his 2nd place finish in the Los Alamitos Futurity (G1). In to challenge him included 8-5 second choice Gunmetal Gray, winner of the Sham (G3) after finishing 5th in the Breeders' Cup Juvenile (G1). and 9-1 Magnificent McCool, a maiden winner last out in his 6th try. Jockey Flavien Prat sent Magnificent McCool to the lead through fractions of 23.67, 46.55, and 1:10.51 while pressed by Mucho Gusto and stalked by 12-1 Easy Shot. Turning for home jockey Joe Talamo sent Mucho Gusto to a 2 length lead through 1 mile in 1:35.57. Kept to task by Talamo, Mucho Gusto drew off to win by 4 3/4 lengths over late-running Gunmetal Gray in 1:41.81. It was another 1/2 length back to Easy Shot third. Unfortunately, 29-1 longest shot Kid Cantina took a bad step, was pulled up at the 5/8 pole by jockey Geovanni Franco, was vanned off and was later euthanized at the barn. Left: Mucho Gusto in the winner's circle. Winning trainer Bob Baffert said, "I know that Joe rode the horse with a lot of confidence today, and we talked about after the Los Alamitos (Futurity), I told him to get to the next level he has to learn to relax, so today was a good day to get him back off those horses, he rode him like he's a good horse and he responded like a good horse. 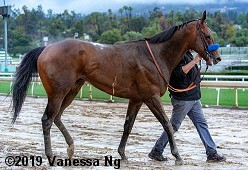 We're just happy that the horse has been doing well and Michael (owner Petersen) here he got into the business, we had some more spirit, we had some luck there and we'd been trying to get to the Derby, we had another good horse that needed some time off so this was actually the second stringer here but he's a good horse." Right: Mucho Gusto heads back to the barn after the race. Left: Mucho Gusto heads into the paddock before the race. Right: Mucho Gusto in the post parade. 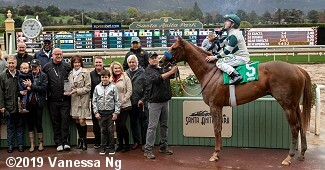 Winning jockey Joe Talamo said, "Every race he's getting better and better. I'm glad I've been working him, because he's worked better, too. He settled today like he's been doing this a hundred times. He galloped out real strong. I don't think distance is going to be any problem. At the 3/8, I was pretty confident. He's a 3-year-old, but he feels like an older horse. He's got a great mind. Those first two horses hopped off there pretty quick so I didn't want to go head and head with speed there; he's such a cool horse, he settled so nice, Bob's done a great job with him in the morning like with a lot of horses. I just kinda rode him like he worked him in the morning, he absolutely loved the mud today." Left: Second place finisher Gunmetal Gray in the post parade. Jockey Mike Smith said, "He ran okay. He was climbing a lot. He had a lot to (overcome)." Right: Third place finisher Easy Shot in the paddock before the race. The Keith Desormeaux trainee improved his record to 1 win, 1 second, and 1 third in 6 starts, earning $55,800 for owner Calumet Farm.